Use Report widgets to turn your raw campaign data into visually striking dashboards with customizable views. For instance, to compare your metrics trending over time (i.e. 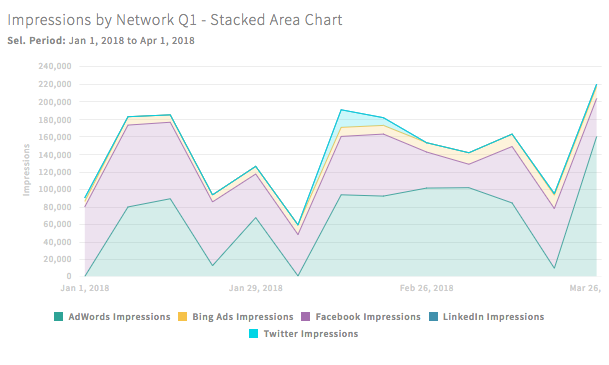 clicks vs. impressions), use a Line Chart widget. Want to see how you’re allocating budget across each network? 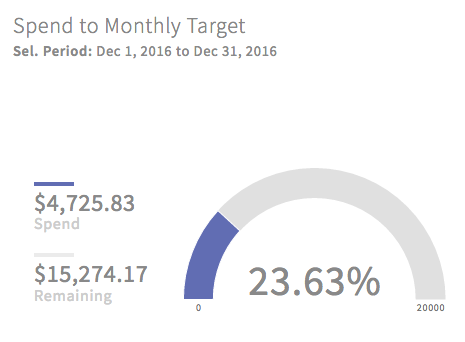 Use the Pie Chart widget to visualize your campaign spend data. Each widget has customizable settings and filters, allowing you to silo in on the most important KPIs to you, your team, or your client. Where are Report Widgets found? They are in the right-hand side of any Report dashboard. Display your data in organized rows and columns. Tables are best used to keep track of information in terms of quantities and numbers, where usually there is an aggregated total sum or average of data. Example: Use a table widget to find your best performing campaigns and quickly spot which campaign is converting the best. This chart presents grouped data with rectangular bars. Lengths of these bars are proportional to their corresponding values. One axis of the chart shows the specific categories being compared, and the other axis represents a value. The Summary Metric Chart is a great way to display metrics with comparisons. With this chart, you can easily select a number of metrics and compare the data against previous periods. Visually see the deltas in change, including percentages. 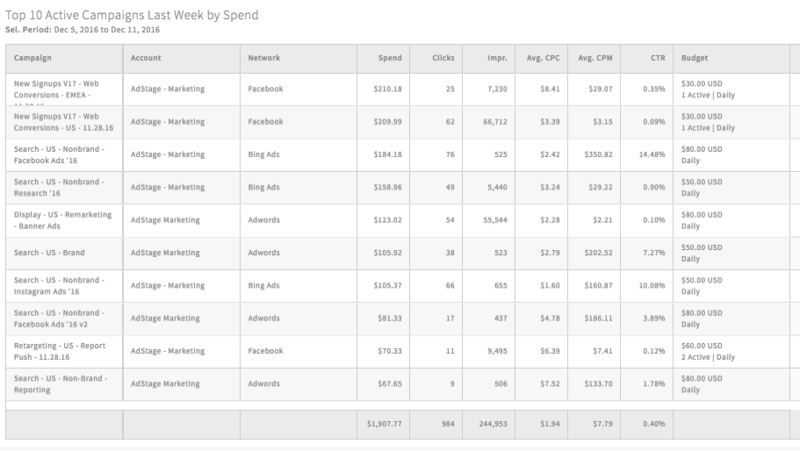 Example: Comparing metrics (Spend, Clicks, CTR) week over week. A Line Chart is a way to display information, as a series of data points, in a linear fashion. This chart is ideal to see the progress of any metric over time or any specific time period. The Pie Chart is a great way to illustrate numerical proportion. A progress bar widget will show your progression towards any given metric goal. With this widget, you can see your current progress to-date, and the amount remaining to achieve your target goal. Use the Ad Creative widget to show your creatives side-by-side with their performance data. 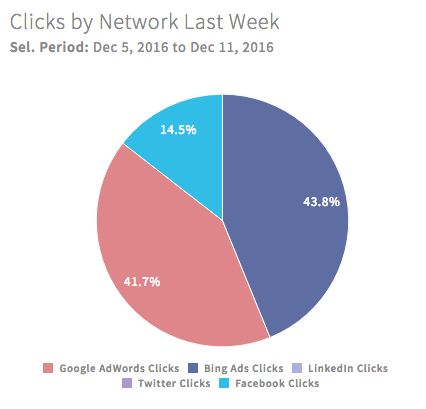 Simply choose a Facebook, AdWords, Twitter, or LinkedIn ad from the drop-down, select a metric to sort by, and choose how many ads you'd like to see in the widget (max: 6) to add it to your dashboard. *Note: Ad blockers must be disabled for ad displays to be visible. A Stacked Area Chart shows the contribution of different categories to a total over time. It’s a great way to visualize part-to-whole analysis. Choose from three options: Stacked Area Chart, 100% Stacked Area Chart, or Cumulative Stacked Area Chart. Example: Use it to see which networks contribute the most to the overall number of impressions. The Funnel widget shows the progression of data as it moves from one phase to the next in a process. It shows the percentage of data retained as it moves down the funnel. Example: Use a funnel widget to show the progress of prospects through the sales funnel (MQLs → SQLs → opportunities → closes) or how an ad performs and contributes to leads. Already have your data in an Excel Spreadsheet or .CSV? Use the Uploaded Table widget option to bring that data into your Report Dashboard in the form of a Table. 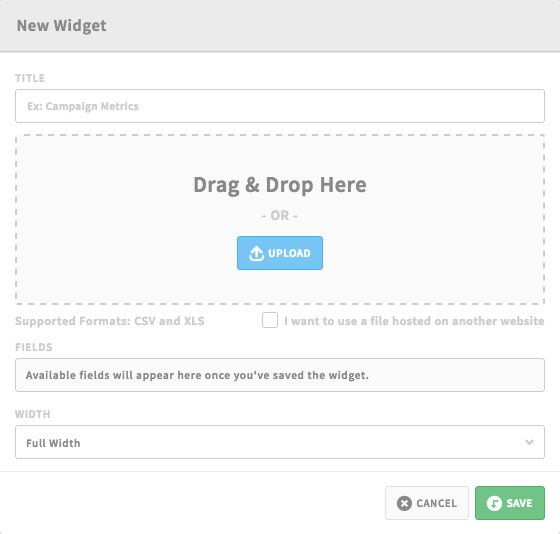 Simply drag and drop the file into the upload field, or manually upload the file, give it a name, and click save. Your new table will populate with the data from your file, in the format of an AdStage Table Widget. Add more customization to your dashboards while breaking up your dashboard so it's easier for your clients or teammates to read. You can customize your section headers by changing colors and adding network icons. Write annotations into your dashboard with a text widget. Here, you can highlight your findings and next steps to your team and/or client. *Learn how to format your text widget here. Use an image widget to place a picture/logo inside your report dashboard, and/or place a screen capture of third-party data (ex: call metrics). Image widgets are great for completing the narrative of your dashboard.